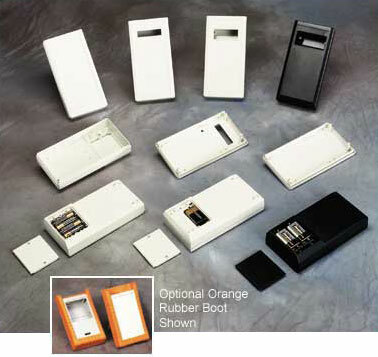 The 90-74 series line of enclosures are designed for portable applications. The cases have a large recessed control area for membrane keyboards. Three mountable battery compartments are available, designed for 4 x 1.5V AA cells, one 9V or 2 x 9V cells. The battery compartment lid is built into the base of the enclosure. Mobile Box Medium - 4AA, 2AA, 1 9V or 2 9V Batt Holder Optional, No batt. 7.68 x 3.98 x 1.73"